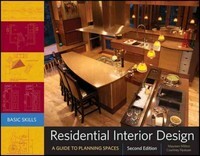 Residential Interior Design 2 Edition The completely revised room-by-room guide to home interior design Residential Interior Design, Second Edition teaches the fundamental skills that are needed to plan interior spaces for all types of homes, regardless of decorative styles, from remodeling to new construction. Taking a step-by-step approach, this valuable primer reviews all aspects of interior architecture as it relates to human factors and daily use. Authors Maureen Mitton and Courtney Nystuen explore the minimal amount of space that is necessary for rooms to function usefully, from the kitchen to the bathroom, the bedroom to the hallway, and every room in between. Packed with hundreds of drawings and photographs, this valuable tool is brimming with useful information regarding codes, mechanical and electrical systems, keys to creating wheelchair accessible spaces, and a variety of additional factors that impact each type of room and its corresponding space. Now featuring a companion website with instructor resources, this new edition is: Revised and updated with new building codes information and expanded information on sustainability, building construction, doors, windows, home offices, and outdoor spaces Illustrated throughout with line drawings and photographs to clearly explain the concepts covered The perfect study aid for the NCIDQ exam With a focus on quality of design over quantity of space, Residential Interior Design, Second Edition is the first stop to designing equally efficient and attractive rooms.